FloodBreak® automatic floodgates are passive flood barriers deployed by the rising floodwater without dependency on people or power. 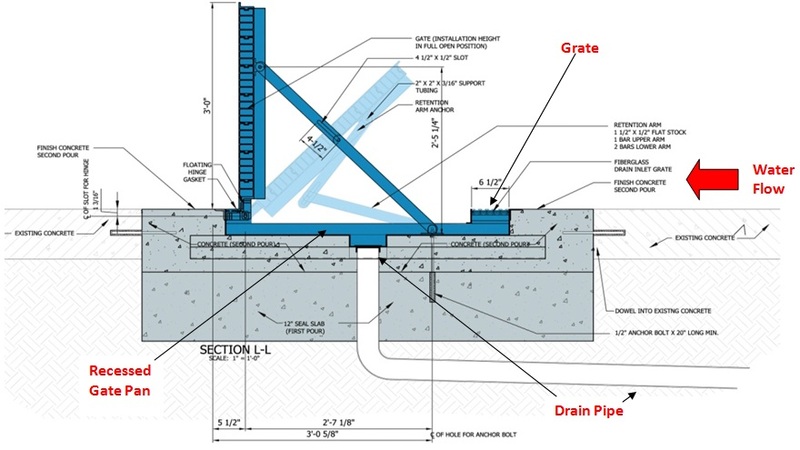 The concept is simple – the rising floodwater creates the hydrostatic pressure to float the buoyant aluminum beam and activate the self-sealing rubber gaskets. The higher the water rises, the higher the flood barrier is lifted until it reaches 90° and is held closed by the floodwater. When the water recedes, the flood barrier returns to it’s recessed location in front of the entry way, allowing vehicle and pedestrian passage to resume. Why does the passive flood barrier float? 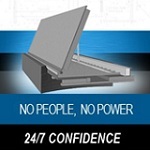 The FloodBreak floodgate is actually a buoyant panel constructed of hollow aluminum extrusions. The extrusions are designed to be structural while also providing excellent flotation. Additionally, the extrusions are chambered so that even if an area of the panel is compromised, the overall panel will still float. This is similar to the design of a ship’s hull, where bulkheads protect the ship even if the hull is locally damaged.